Israel is becoming increasingly isolated in the Middle East, US Defence Secretary Leon Panetta has warned. He said Israel should restart peace talks with the Palestinians and restore good relations with Turkey and Egypt. Mr Panetta spoke while travelling to the region for talks with Israeli and Palestinian leaders. Diplomatic efforts have intensified recently to push the two sides back to peace talks that were abandoned last year. Israel has agreed to participate in such talks, but the Palestinians want Israel to stop building more homes for settlers in the occupied territories. "It's pretty clear, at this dramatic time in the Middle East when there have been so many changes, that it is not a good situation for Israel to become increasingly isolated. 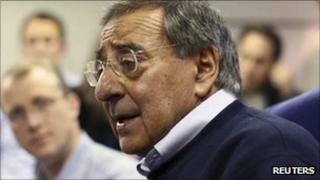 And this is what has happened," Mr Panetta told journalists aboard a US Air Force plane en route to the Middle East. He is due to have meetings with Israeli Prime Minister Benjamin Netanyahu and Defence Minister Ehud Barak. Mr Panetta said the US would make sure Israel maintained its military superiority in the region, but should use this advantage to press for peace. "As they take risks for peace, we will be able to provide the security that they will need in order to ensure that they can have the room hopefully to negotiate," he said. Mr Panetta is also due to meet with Palestinian Authority President Mahmoud Abbas and Prime Minister Salam Fayyad. The US opposes the Palestinian bid for full membership of the United Nations. Washington has threatened to veto the move if it comes to a vote in the Security Council, saying negotiations should resume to a two-state solution. Mr Panetta said he would press the Palestinians to return to peace talks. "The most important thing they can do is go to the negotiating table. You are not going to achieve Middle East peace by trying to slam-dunk it at the UN," he said. Mr Abbas presented a formal request to the UN asking for membership of a Palestinian state in the West Bank, Gaza Strip and East Jerusalem, based on the 1967 borders. Israel captured these territories in the 1967 war and still occupies the West Bank and East Jerusalem.